Although the sleepless nights may have you feeling otherwise, your baby will only be a newborn for a few weeks. Many parents preserve their memories of this special time by taking their baby to get newborn portraits. With proper research and planning, you can get great photos and survive the experience with your sanity intact. 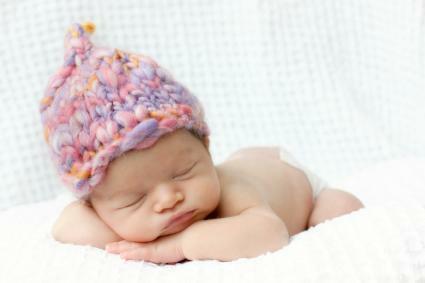 You can have newborn baby photos taken at an independent photography studio or a studio in a department store. Which one you choose will depend on the look you have in mind, the options available in your area, and your budget. One of the most popular options for getting a great picture of your newborn is to use a local, independent photographer. Often, the cost of a session with an independent photographer will run from about $50 to well over $200. While this may seem expensive, independent photographers sometimes give you the digital images of your baby's photos. This means you can order your own prints for an affordable rate. Use the searchable database at Professional Photographers of America. You can search by location, the photographer's name, or any specialties the photographer might have. The database lists infant photographers as "portrait photographers." Talk to friends and family who have recently had babies. Ask if they had a good experience with photographers in your area. A personal recommendation is a great way to ensure you'll be happy with the results. Call the photography or art department at your local college or university. Often, the staff at these institutions can recommend a great newborn photographer in your area. Several department stores have photo studios designed to be affordable and easy for families with children. Typically, the photo session is short and inexpensive, often about $25 to $50. You'll have to purchase your photos from the store, rather than order them yourself. This can add to the cost, but depending on the number of photos you'd like, it may be a budget-friendly option. JC Penney - JCP Portraits, the photo studio in many JC Penney stores, often runs specials for free sittings. The studio is usually located in a quiet back corner of the store, making the process a little easier when you have a newborn. Target - The portrait studio at Target specializes in family photos and pictures of children and babies, including newborns. They often offer specials on affordable printing and photo greeting cards. If you're looking for a unique style, you're more likely to find it at an independent studio. Be sure to ask the photographer about his or her style and view examples of past work. If you need affordable photos, you're more likely to get a good deal at a department store studio. Watch for coupons online and in your mailbox, and compare prices between studios. For the best results, visit the studio with your baby before the big day. That way, you can select a studio that is quiet and won't be over-stimulating for your newborn. If possible, speak to the photographer on the phone or in person before the shoot. Ask about how the photographer handles fussy babies and whether it's possible to reschedule if your baby has a rough day. After you've selected a studio for your newborn's first photos, you'll need to make sure you set your baby up for success. As the parent of a newborn, you've already got a lot going on in your life, so it's also very important that you make this experience stress-free for yourself. Choose the right outfit. Even though that plaid dress or striped shirt is cute, your baby should take center stage in these photos. Pick a simple outfit that looks great on your newborn. Also, consider having some photos taken in just a diaper. When selecting your baby's clothing, make sure the fabric is comfortable. Stay away from anything itchy or stiff, and choose clothing that is warm enough or cool enough to keep your baby comfy. If you want photos of your baby sleeping, schedule the session during naptime. Your newborn will likely sleep through most of the session. To keep your baby from getting fussy, be sure to feed and change him or her immediately before the appointment. For many newborns, the sense of smell is an important comforting tool. If you anticipate that your baby will be upset, bring something that smells familiar. A favorite blanket or toy can work wonders. Wear something simple and comfortable, and do your hair and makeup before the session. You may need or want to step into the photos, and you'll have bigger things to worry about than how your look. Bring an extra change of clothing for your baby in case of accidents. If your baby tends to spit up, bring an extra top for yourself too. Make sure you are well-rested and have eaten before your studio appointment. It's easier to patient when you're not hungry or tired. Remember to relax. If you are tense, your baby will be tense as well. It's easy to let the first few weeks of life with your baby pass in a whirl of feedings, changings, and visits from family. However, taking the time to get newborn baby studio portraits gives you a snapshot of this special moment in your baby's life. Years from now, it won't matter what your baby wore or where you had your photos taken. You'll simply be glad you made it a priority to preserve those special newborn memories.